Lanny Young Story » Mr. Dunn Goes to Montgomery | Who's Behind the Mask? — David Hendricks, manager of the Green Mountain landfill, describing a visit to the site earlier this year by Lanny Young, his 25-year old son Ross, and a Korean American businessman, Gabe Kim, who may or may not be the true owner of the mysterious company called, “Big Sky Environmental LLC.” Throughout the visit, and at other times, Lanny Young used his son Ross’s name as a means of disguising his past as the scandal-plagued felon at the center of the Siegelman administration’s “Goat Hill Construction” scandal. Lanny Young,, during one of his visits early this year to the Green Mountain Landfill in Adamsville, near Birmingham. A landfill employee secretly took the picture with his cell phone. Author’s Note: This web-site is and shall continue to be devoted to exposing those involved in the smear campaign against former Alabama Public Service Commissioner Terry Dunn and, specifically, Alabama Power’s role as the engineer and paymaster of the campaign. This story is not connected to the Dunn issue. For purposes of full disclosure, I was contacted some months ago by Daniel Cowart Jr., a member of an Atlanta family that some 10 years ago invested millions of dollars in building and permitting a major Jefferson County landfill. I was not familiar with the Cowart family, or the landfill project. I was contacted because I’d written, as a reporter for the Mobile Register, dozens of articles about an Alabama landfill developer, Clayton “Lanny” Young. He was also a major figure in my book, “The Governor of Goat Hill,” about the multitude of scandals involving former Alabama Gov. Don Siegelman. I was hired (I have a one person research/investigation business) and paid (about $900, plus expenses), for research into Lanny Young and related issues. These included a company called Big Sky Environmental LLC. I have not billed for any time or expenses incurred since June 22 and will not be billing for any of the time or expenses incurred writing this story. I wrote the following story for one reason: I wanted to. In some ways it can be seen as a follow-up chapter to the “Lanny Young” elements of my book. I received and requested permission from Cowart to write the story that is a result, after all, of being hired by him. But neither he nor anyone else has proofed this story or been shown it prior to publication. I anticipate that there will be things in the story that the Cowarts were not aware of. Like my book, and much that I write, author’s notes included, this story is long. I also use and cite all manner of public records and other records and images to support and illustrate the story. I hope you enjoy it and, if so, pass it on to others who you believe might find it interesting. People with tips or evidence related to this matter or the campaign against Dunn are encouraged to call me at 251-454-1911, or email me at, eddcurran@aol.com. Lastly, this story was published/posted on Aug. 30. Since then I’ve learned a few new things. I’m going to incorporate new information into the story, and put it in red type. This way, people who have already read the story but want to check on updates can scroll down and look for red type. On Jan. 19, a bald man in his mid 50’s pulled into the parking lot of the Green Mountain Landfill in Adamsville, Ala., and strode into the office. David Hendricks, who’d been managing the day to day operations at the landfill since 2009, recognized the man before he even got out of his car. Hendricks had never met Lanny Young, but knew about him, and what he looked like, from the countless media reports involving the Siegelman case. His interest in Young’s role was enhanced because of his work in the landfill business, he said. In any event, Young, at that stage, wasn’t trying to conceal his identify. Before leaving, Young wrote down his name and number and gave it to Hendricks. After Young left, Hendricks called Lee Katz, a highly-respected Atlanta based investments professional with the Glass Rattner. Katz specializes in “turning around” distressed companies — such as, in this case, the Green Mountain Landfill. One of Katz’s responsibilities was to field offers/bids for the landfill. He was thus in regular contact with Hendricks, such as to coordinate visits by interested parties. Hendricks said he warned Katz about Young. I interviewed Hendricks last week, after reading testimony he gave on July 16, at a hearing in federal bankruptcy court in Atlanta. I was surprised to see that he mentioned my book during his testimony (see below). My book is quite long, and, in truth, there are much quicker ways to learn about Lanny Young, though I do appreciate the plug. The point is, Katz was warned, as he would be, again and again. If he’d heeded these warnings, there would be no story here. But he didn’t. This is from Lee Katz’s LinkedIn page. After Hendricks warning to Katz — in all likelihood, as a result of it — Lanny Young started using another name when representing himself as an owner and/or representative of Big Sky Environmental LLC. Lanny Young began introducing himself as Ross Young. which happens to be the name of his 25-year old son. I suggest to readers that they take a moment — that’s all it will require — to conduct due diligence into Lanny Young. Open your browser, and Google “Lanny Young.” If you do this, you will have done more due diligence than the extremely well paid professionals involved in overseeing this sizable, multi-million dollar transaction. You will also find that every “hit” on the first “page” of results from the “Lanny Young” search is a news story or something akin to it, all of them about the particular Lanny Young that Katz and repeatedly told was showing up at the landfill. To appreciate this story, one must know at least a little bit about Lanny Young and, separately, the Green Mountain Landfill. First, the landfill. The following summary is, if not 100 percent accurate, close enough for our purposes here. 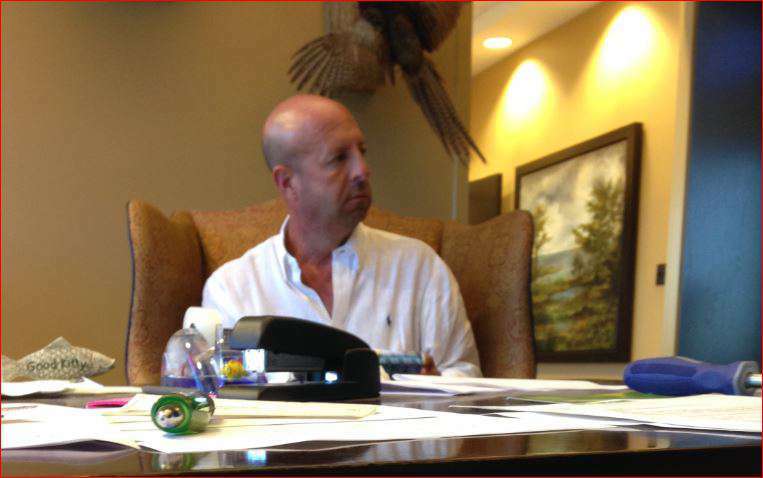 In 2005, an Atlanta businessman, Dan Cowart, formed a business, Green Mountain Management. This company spent, as I understand it, more than $20 million to build and permit a landfill in Adamsville, Ala., which is in Jefferson County. Most of that money came from the fortune built by Cowart’s father, well-known Atlanta-area developer Jim Cowart. The “Green Mountain Landfill,” as its generally called, is or has the potential to be the largest landfill in the Southeast. It is permitted to accept more garbage than any landfill in Alabama, and may accept garbage from throughout the country. People I’ve interviewed for this story have described Dan Cowart as an extremely nice and trusting man, but someone with no understanding of the landfill business. He and Green Mountain engaged a series of landfill professionals to run the business, and largely allowed them to run it. The Cowarts position is that the people they hired mismanaged the business, to include, in at least one case, routing company funds to themselves or companies under their control. This picture, showing a portion of the Green Mountain landfill, is on the new website of Big Sky Environmental. I’m not taking a position one way or another about these allegations and disputes. The relevance of the landfill’s troubled past is that these problems, and perhaps others, resulted in massive losses and, ultimately, bankruptcy. The co-debtors in the bankruptcy case, which was filed last year in Atlanta, are two Cowart companies, Green Mountain Management and Georgia Flattop Partners. The Cowarts initially engaged Lee Katz to help them save the company and/or navigate a result that would allow them to recover at least some of the immense sums lost in the Alabama landfill venture. As I understand it, Katz, with the Cowarts’ approval, took on a new role in the bankruptcy case. In this new role, Katz representis the bankruptcy estate, rather than, specifically, the Cowarts’ interests. In his new role, Katz was tasked overseeing the business operations of the landfill and with finding a buyer for the landfill; or, in any event, finding a business solution that would result in creditors, such as lenders, getting some or all of their money back. It is, therefore, his responsibility to consider and review offers for the landfill. It should be noted that the Cowarts and Katz are now much at odds, as the bankruptcy records make clear. Now, moving on to Lanny Young. I trust that many readers of this story are familiar with Young. For those who are not, there is no way, here, to do justice to this charismatic figure who participated in the downfall of Siegelman and others, including former Cherokee County Probate Judge Phillip Jordan. The main thing to know is that, in the late 1990s and early 2000s, Young’s primary business was a landfill developer and, truthfully, middle man for Waste Management as regards bribing public officials to win concessions valued in the tens of millions for the company. He was, for example, hired by Waste Management to get the Alabama Revenue Department to drastically reduce the taxes the company paid at its hazardous waste landfill in Emelle. Waste Management pledged to pay Young $500,000 if he could deliver the tax change. He was given 30 days to accomplish the task. Soon thereafter, Siegelman arranged for the demotion of the Revenue Department lawyer who refused to go along with the tax cut. He was replaced him with a political appointee — the first political appointee to ever hold the position. The new lawyer blessed the change. On that very day, as evidence at trial showed, Siegelman sent Young a signed picture of himself. Not long after, Waste Management wired the agreed upon half-million dollars to a Birmingham law firm, which then funneled it on to Young. 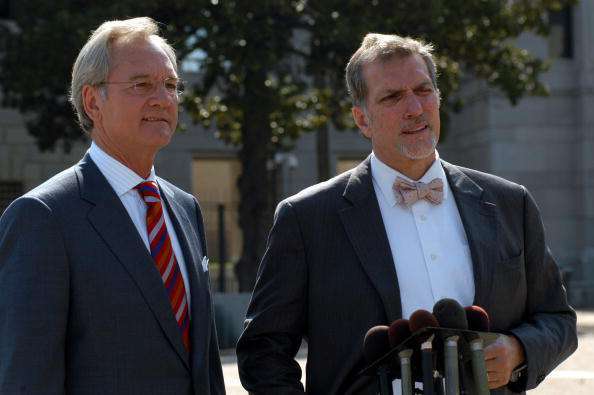 Siegelman and his lawyer, Vince Kilborn, addressing the media during a break in Siegelman’s 2006 corruption trial. To Lanny Young’s credit, he did not wilt under Kilborn’s relentless and insult-laden cross examination. At one point, Kilborn asked Young if he was a “criminal tax fraud artist.” The day before Young’ testified, Siegelman called him “a joke,” but you could see fear in the former governor’s eyes. As much as anyone, he knew Young could hurt him. Young was paid some $8 million for delivering to Waste Management the right to build and operate the “Three Corners Landfill” in Cherokee County. Phillip Jordan, that county’s probate judge and county commissioner chairman, was to plead guilty to accepting bribes from Young. The probate judge from the county next door helped Jordan cash the checks. Soon after the FBI came to interview that judge, he was found dead at the bottom of a cliff near his home, almost certainly having committed suicide. In April 2001, I wrote the first of many stories reporting that the Siegelman administration had awarded a contract to a just formed company, G.H. Construction (for, Goat Hill), to oversee construction a $20 million state warehouse project. The stories showed, among other things, that Young had already forged a bogus $90,000 bill for engineering services for work never done, and was paid that, and other bogus sums, by the state. It was later revealed that G.H. Construction was so unqualified that the bonding company would only bond the job under the condition that G.H. Construction never set foot on the site. The company’s contracts with the state showed G.H. Construction was to be paid some $2.4 million, for staying out of the way. Young eventually agreed to plead guilty. The information and testimony he provided was used to build cases against Siegelman, top Siegelman aide Nick Bailey, Phillip Jordan, and others. Below is a check Bailey wrote in January 2000, shortly after Young was summoned for a meeting in the governor’s office. Siegelman needed some money to avoid bouncing a large tax payment he’d just made. Per the arrangement with Siegelman, Young wrote a check to cash, then issued a money order to Bailey, who immediately wrote a check for the same $9,200 to Lori Allen. That’s the maiden name of Siegelman’s wife, and the name Siegelman had directed Bailey to use. All three checks, including the one below, were introduced as evidence at Siegelman’s trial. One of the charges to which Siegelman was found guilty involved a scheme by Siegelman and Bailey to cover-up Young’s $9,200 payment to Siegelman by creating a bogus evidentiary record to support a false tale that Bailey borrowed the $9,200 from Young in order to buy a motorcycle from Siegelman. Prosecutors presented the jury with all manner of holes in that story, such as that Nick Bailey didn’t ride motorcycles or ever take actual possession of the one he “bought” from the governor. Young, as a result of his cooperation, was only sentenced to two years, of which he served about a year. The point of all this: Dave Hendricks, like many Alabamians who follow state news, knew what Lanny Young looked like, and was quite familiar with Young’s history of bribing public officials, such as when trying to gain control of landfills and making deals involving garbage. Several weeks after Young came to the site, Katz called Hendricks to tell him that Young was going to be visiting again, and for Hendricks to provide him with access to the landfill and its records. Katz, said Hendricks, told him that he’d been mistaken — it wasn’t Lanny Young who’d visited the landfill on Jan. 19, but Ross Young. Hendricks said he tried to convince Katz otherwise. He even sent Katz a picture of the piece of paper on which Young written his name and phone number. (See below). During the July bankruptcy hearing, Katz acknowledged that Hendricks had told him about Young, even noting that Hendricks had suggested he get a book that contained tales of Young’s scandals. 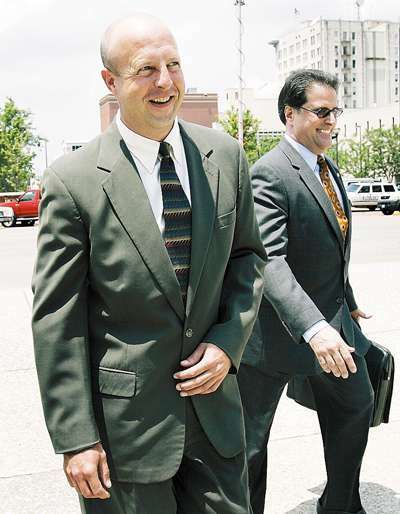 Katz testified that, in response to Hendricks’ warnings, he contacted Gary Marsh, an Atlanta-based lawyer representing Big Sky’s effort to buy the landfill out of bankruptcy. The following is from his testimony, the questions from a lawyer representing one of the parties objecting to Big Sky’s bid. Q. Mr. Katz, you said that earlier you asked Mr. Marsh the identify of this person that was going by the name of Ross Young, correct? Q. And in response to your question, Mr. Marsh – was it Mr. Marsh that represented that this in fact was not Lanny Young? Q. And was that in writing or orally? Q. E-mail. And so that wasn’t true was it? A. At this point in time, it was not. Lanny’s Facebook page has a picture of him with his son (see below). Ross Young’s Facebook page also has a picture of him with his father. Hendricks — whose job did not include due diligence research on potential buyers — had found out who Ross Young was, and what he looked like. He already knew what Lanny Young looked like, having, for example, sat and chatted with him a few weeks earlier. This photo, from Lanny Young’s Facebook page, shows him with his son, Ross Young. Just as Katz said, Big Sky’s team came to the landfill the next day. “When they got there, there were four other guys with Lanny, and the funny thing was, one of them was Ross, but all the guys were calling Lanny Ross. The real Ross was never introduced,” said Hendricks. Also there that day was Tom Calloway, a consulting engineer who, like Hendricks, knew what Lanny Young looked like and, according to Hendricks, was as nonplussed as he with the charade they were essentially being ordered to participate in. “We (he and Calloway) just kind of let them play their little charade,” Hendricks said. The charade reached a peak level of absurdity when Gabe Kim called Lanny by his real name, instead of addressing him as Ross. 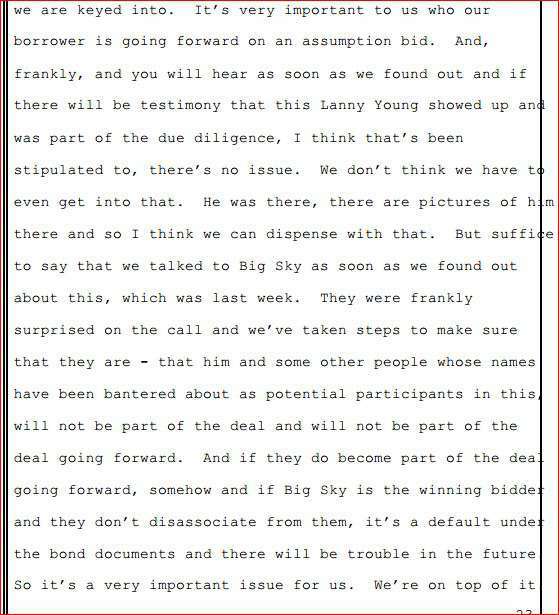 As will be seen, the Lanny/Ross debacle was to become a key issue in mid July, in the bankruptcy case, and Big Sky produced a contract. It showed that on March 10 — about two months after Lanny Young first came to the landfill — that a California company, Exoro Global LLC, had hired Young as an independent contractor. Gabe Kim signed the contract on behalf of Exoro Global. Below are portions of the contract. After Katz told Hendricks that Kim was the real boss and Young just a consultant, Hendricks hearkened back to when Young yelled at Kim for calling him Lanny instead of Ross. “That’s a helluva way to talk to someone you work for,” Hendricks said, chuckling. “I was a police officer in Birmingham for eight years, and this beats anything I’ve ever seen,” he said. As noted at the top of the story, I was hired in June by Dan Cowart’s son, Daniel Cowart, to research Big Sky Environmental. One of the first things I do when researching a company is to look for incorporation papers on the Alabama Secretary of State website. As it so happened, Big Sky filed its Alabama incorporation papers on June 12, shortly before I was engaged to research the company. I ordered/paid for the actual document, as opposed to just the summary on the Secretary of State website, and was rewarded with some interesting information. The following portion of the document suggested four avenues of inquiry. They were: What was at the Signal Hill, CA address; who was Sara N. Tower; who or what company resided at the crossed out address in Michigan; and the same question for the address in Homewood, a suburb of Birmingham. 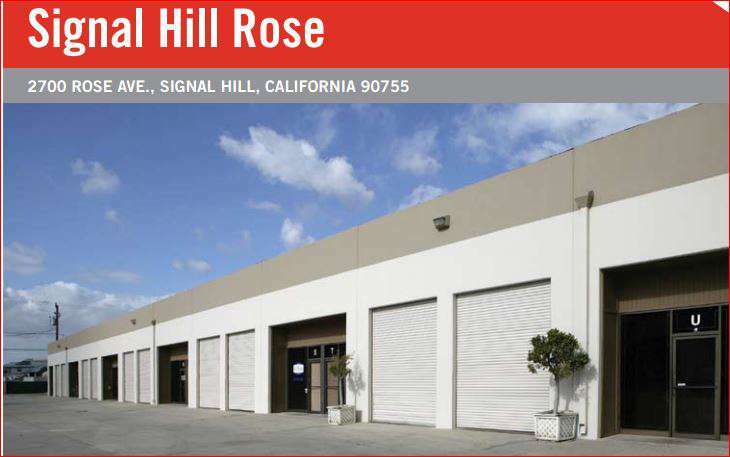 I began with the address given as Big Sky’s corporate home — 2700 Rose Ave., Suite K, in Signal Hill, CA, a town in Los Angeles County. Internet searches revealed this as the address of Platinum Auto Network and Brokerage. Below is a screen shot from the company’s website. 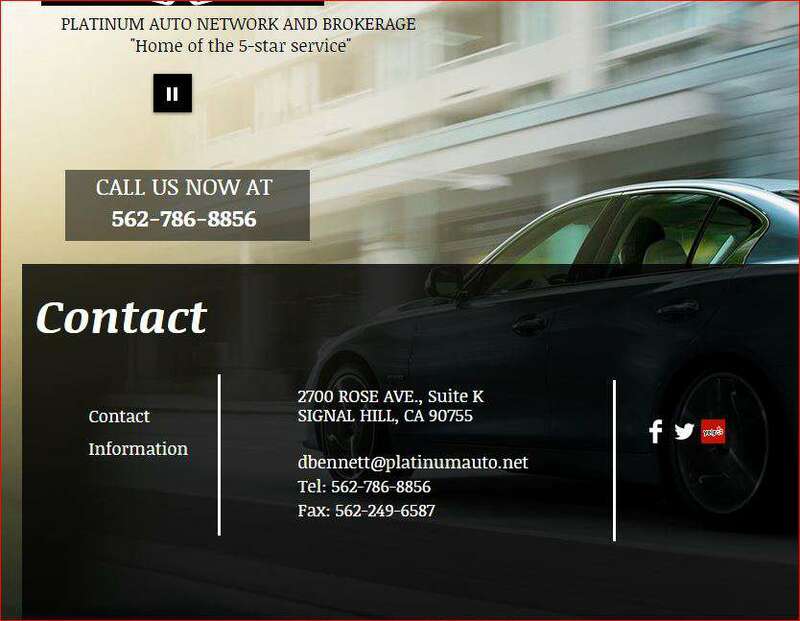 I called the number on the website and it was indeed Platinum Auto Network. I told the man who answered the phone that I was calling to speak to someone involved with an Alabama landfill company called Big Sky Environmental. The man seemed confused. I explained that Platinum Plus Auto Network’s address and phone number were listed on the landfill company’s Alabama incorporation papers. He told me I would have to get in touch with the owner Platinum Auto Network. The name he gave me: Gabe Kim. I tried to reach Kim, but was unsuccessful. Below is a picture of the commercial development that is home to the Platinum Auto Network. It is also, according to numerous documents, the corporate home of Big Sky Environmental. The Michigan address — typed, then cross out — was quickly determined to be the law office of Sara N. Tower, who is shown as having drafted the incorporation papers and as being the “organizer/registered agent” of Big Sky Environmental. 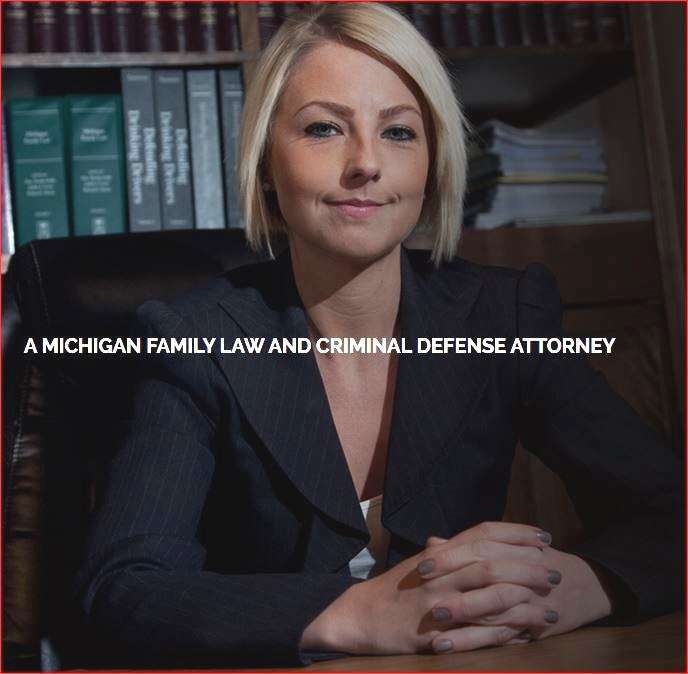 Michigan State Bar Association records reflect that she graduated from law school in 2012, worked in the local public defender’s office, and now works with a small firm. The photo below is from the firm’s website. Kim was asked at the July bankruptcy hearing how he came to engage a criminal defense lawyer from Michigan to draft Big Sky’s incorporation papers. After all, he’s from California, and Big Sky is in Alabama. Q. Big Sky was formed in Michigan. Could you tell me why that was? A. We used a lawyer out of Michigan. Q. What is your relationship with her? A. Sarah has advised me on numerous other items, but there’s no structured relationship, no. Q. Is her primary practice a criminal practice? A. Not that I know of. Alabama corporation records show that Tower has served a similar role for at least one other Alabama business. In September 2014, she drafted the incorporation papers for a company called, RL Jackson Engineering & Consulting LLC. The address of RL Jackson is Lanny Young’s residence in Jacksonville, Ala. 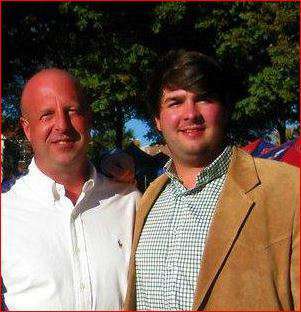 It is my understanding, from various records and social media, that Young’s son Ross, an Ole Miss graduate, lives in Mississippi. The RL Jackson incorporation papers suggest that whatever Tower’s role, it’s as a result from a connection with Lanny Young, not Gabe Kim. 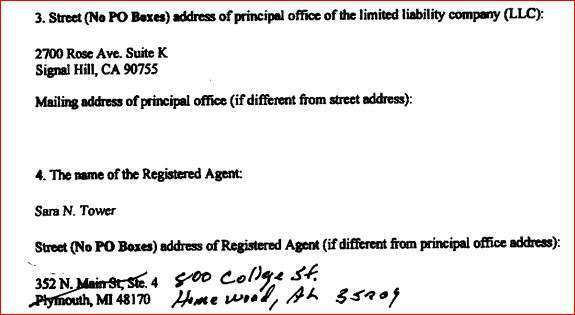 Below is a picture of the Alabama address of Big Sky Environmental, as shown on the incorporation papers. It is described as being the address for the “organizer,” of Big Sky, and the “organizer” — a word not often seen on Alabama corporation records — is shown as being Sara Tower. Internet searches reflect it is a rental home. I made some attempts to determine who lived there, including a minimal effort to contact the owner. If this little mystery is solved, I will update the story with that information. At the July hearing, Kim was asked about the Homewood location. Here is the relevant portion of Kim’s testimony. Q. 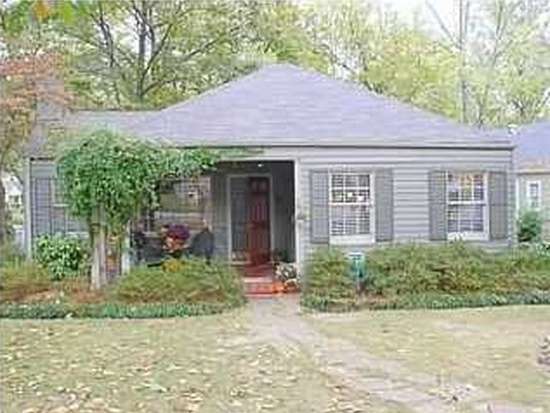 It says 800 College Street, Homewood, Alabama. What is that? Where is that? A. I’m not sure. It was – we requested an address from one of the consultants. Q. It’s an address given to you by one of the consultants. I e-mailed Tower a series of questions but received no response. It would be my guess — and it’s only that — that she somehow knows Lanny Young, and that he asked her to incorporate these two companies for him. It seems unlikely that she has any major role in these companies or the landfill project. I suspect that she, like Young’s son, Ross, were in some duplicitous manner coerced by Young. Some people are gambling addicts, but Young, it seems, has an addictive mania for landfill deals. Pardon the armchair psychology, but do I believe that and also, that he’s not the only one with that affliction, rare though it is. So: The addresses on the incorporation papers are: A medium sized house in Birmingham; an an auto leasing business outside of Los Angeles; and the law office of a young Michigan attorney who practices criminal and family law. Gabe Kim’s name is not on Big Sky’s incorporation papers. The lone “member” of Big Sky, according to the incorporation records, is a company called Exoro Capital Global LLC. 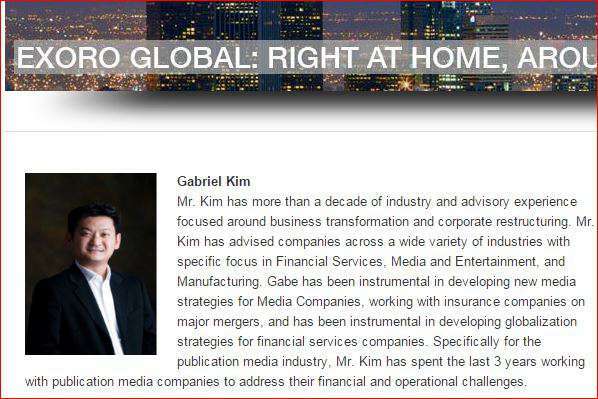 According to his LinkedIn resume, Gabriel “Gabe” Kim is a Washington University graduate who formed Exoro Global in 2010, after five years as a consultant with Deloitte Consulting and, before that, 6 years at IBM. 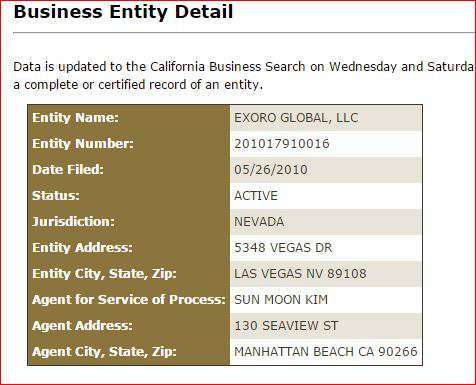 Records show that Exoro Global Capital was incorporated in Nevada, by Sun Moon Kim, which was Kim’s name before he had it legally changed to Gabriel. With its headquarters in New York City, and satellite offices in Los Angeles, New York, Singapore and Amsterdam and based on its history of having conducted business in 43 countries, Exoro is well-positioned as the premier global provider of value-creation services. During the July 16 hearing, Kim was asked how many employees his company had. “It fluctuates at any given time, but our motto is not to hold many full-time employees. I believe at this time we have two or three,” he said. Kim testified that he was provided with Lanny Young’s resume, was impressed, and hired him. He said he did not learn about Young’s criminal past until later, but was not concerned. “I believe that a man that does his time has every right to have equal employment. I had hired him a consultant and I didn’t feel that that was a big issue associated with a due diligence of an acquisition,” Kim said. It would appear that Kim was also not troubled that Lanny Young was misrepresenting himself as Ross Young. Kim was asked if he was aware that Lanny Young wanted to purchase the landfill for himself. “I have no knowledge of that,” Kim said. NOTE, on Sept. 1: Two days after I published this story, I went back to Kim’s Linkedin page and took a look at his “endorsements.’ Let me preface this by saying, as a Linkedin member myself, that a connection on Linkedin means little, and an endorsement doesn’t mean that much either. Nevertheless, I thought it odd to see that Nick Bailey — the former Siegelman aide mentioned above, who pleaded guilty for crimes related to Lanny Young and the G.H. Construction scandal — had “endorsed” Gabe Kim. In fact, he endorsed him 15 times, as in, for 15 different “skills” Kim has on his page. Bailey is from Alabama and Kim had no known Alabama connections until getting involved in this landfill. I don’t have any explanation for this. But it does seem an awful small world when Kim’s clearly limited Alabama connections so happen to include the two key figures in the G.H. Construction scandal. 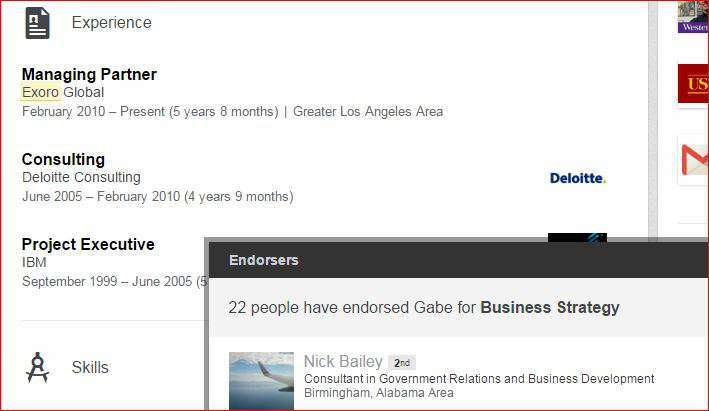 One of Nick Bailey’s Linkedin endorsements of Gabe Kim. As of early July, with the bankruptcy case proceeding toward sale to Big Sky, none of the parties with real influence over the matter had done anything to ensure the removal of Lanny Young from the deal. That changed on July 6, when Birmingham businessman Tommy Hudson sent a letter to John Amboian, the Chicago-based chairman of Nuveen Investments. Hudson, owner of the Jefferson County company Hudco, had become interested in the landfill as an investment, formed a company and entered a bid in the bankruptcy case. Nuveen holds all or most of the bonds that were sold in 2009 to provide some $17 million in additional funding to the floundering landfill. Nuveen, it should be noted, has a substantial role in the decision on the future of the landfill, such as which bidder in the bankruptcy case gets the landfill. To a considerable extent, Katz is working for Nuveen, since it is the main secured creditor. Hudson’s letter apparently went into considerable detail about Young’s past, and related issues. From a legal perspective, Young’s status as a felon was relevant because the 2009 bonds are publicly traded securities and are subject to certain restrictions. 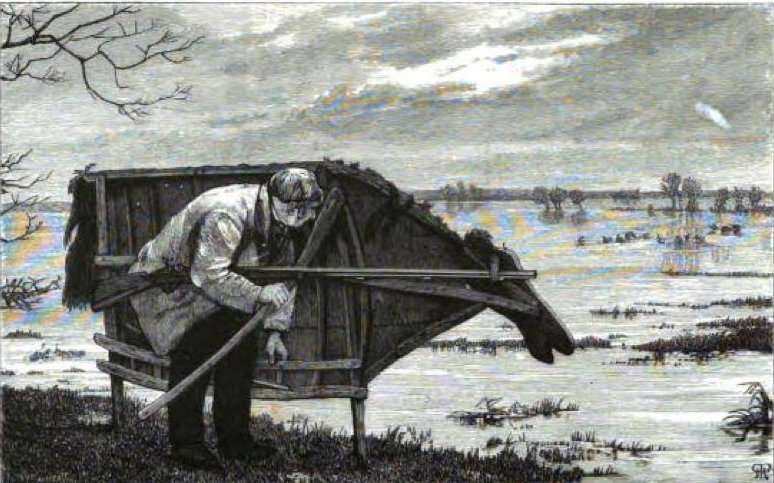 As I understand it, a stalking horse bidder is a bidder who offers a bid, pledges to stand by it, and is rewarded for this risk by having its expenses reimbursed and/or paid a certain sum of it loses the bid. The stalking horse is, to a considerable extent, insured against failure. As I understand it, “stalking horse” status is generally used to drum up interest when there is none. Hudson and others have argued that in this case, there is interest, and thus, no need for a stalking horse. Katz and Big Sky have argued — to the satisfaction of U.S. Bankruptcy Court Judge Barbara Ellis-Monro -that the stalking horse status accorded Big Sky was merited. But: When Amboian learned that this Lanny Young character was to be involved in a landfill project essentially owned by Nuveen, he let his displeasure be known. This apparently filtered down to the regional Nuveen office, and also to UMB Bank. The bank — which serves, as I understand it, as the trustee of the bonds — also has a role in ensuring that any buyer of the landfill satisfies the “public” nature of the bonds. From there, it filtered down to Katz, then to Big Sky and Gabe Kim. Later in the hearing, Kim testified that, as a result of directive from UMB, he had terminated Lanny Young as well as Ross Young, and done so in writing. Q. And why was (the contract with Lanny Young) terminated? A. I was told by UMB that there was issues associated with an owner of somebody who’s assuming a public bond to have associations with a anybody with criminal records. And so as, you know, as part of that I said that any association was not intentional. I don’t believe that criminals should not get a fair chance in working so, you know, I kept the consulting agreement in place. But if it was a condition of closing the bond, I would happily terminate the arrangement. Throughout the hearing, Gary Marsh, Big Sky’s lawyer, repeatedly argued that the court should cease allowing continued testimony about Lanny Young’s role in Big Sky’s bid for the landfill. Big Sky had parted ways with Young, and as such, the continued focus on Young was a “total red herring” designed to unfairly tarnish Big Sky, Marsh said. “At a certain point Mr. Kim learned about his criminal conviction and the trustee expressed concern about having Mr. Young involved so we’ve terminated our relationship with him or Big Sky has and that’s what Mr. Kim’s declaration says,” Marsh told the court. After the hearing, Katz called Hendricks to tell him that appraisers hired by Big Sky would be coming to the landfill and that Hendricks should provide them access to the site and the site records. The group Kendricks had just seen with Young identified themselves as the appraisers Hendricks had been told to expect, he said. Kendricks said he and landfill employees continued to see Young in the area, but there was no proof of his continued involvement. That changed on Aug. 21. On that day, Lanny Young and Gabe Kim went to one of the Birmingham locations of Tractor & Equipment Company, a well-known provider of equipment for heavy industry, including landfills and, specifically, the Green Mountain landfill. A manager at the store, familiar with Young’s past, and also with his efforts at the landfill, contacted a friend who worked at Green Mountain. Late last week, the company salesmen agreed to provide an affidavit describing the visit. 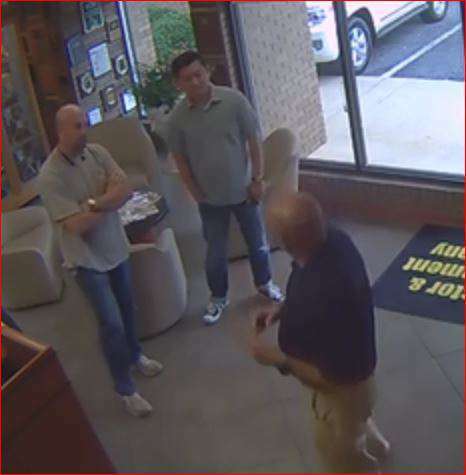 He stated, among other things, that Young and the “Asian gentleman” told him they wanted to look at some equipment because they were “soon to be the new owners of Green Mountain Management.” Young also told the salesman that he was about to take Kim to the airport. Tractor & Equipment, clearly leery of Young, provided the affidavit to the Cowarts. They also provided a clip from their video camera, showing Young and Kim entering the store. Lanny Young and Gabe Kim during their Aug. 21 visit to Tractor & Equipment. Based on the affidavit and video, it would seem that Gabe Kim and Big Sky Environmental have not discontinued their with Lanny Young. This story is already far too long, but this needs to be understood: Big Sky’s bid, at least as I understand it, is higher than the other bids. At the same time, testimony reflects serious questions about the financing — whose providing it, can they be counted on — as well as multiple, valid concerns about Kim’s company, Exoro Global Capital. However, financial information provided to the bondholders (Nuveen) and Katz was deemed sufficient, and Big Sky was determined to have the winning bid. On August 17, Big Sky assumed control of the landfill. Hendricks was out, and a new manager, Tom Herrington, was in. The 63 year-old Herrington is assuredly qualified. He has worked for decades in the garbage business, including a long tenure with Waste Management, where he served as a Georgia-based regional manager whose territory included Alabama. That’s how he came to know Lanny Young. “Brazeal” is Birmingham lawyer Ellis Brazeal. I have always believed that Brazeal, and Waste Management — including Tom Herrington — were in their way chief participants in Young’s successful efforts to corruptly influence Cherokee County Probate Judge Phillip Jordan, Siegelman, and other members of the Siegelman administration. The $1 million was wired to Young. He had, after all, accomplished one of the key elements of his $8 million deal with Waste Management to deliver the landfill to Waste Management and under certain financial terms favorable to the company and engineered by Young. Jordan, selfish almost beyond belief, had taken a bribe in return for using his influence to increase Waste Management’s profits and decrease the sum paid to Cherokee County. To suggest that Herrington and for that matter Brazeal didn’t know exactly what was going on would be to accuse both of being imbeciles. Brazeal, through his firm, would later became the conduit of the $500,00 payment to Young for the previously described contract to deliver the tax cut at Emelle. Some 15 years later, or so it certainly appears, Lanny Young and Tom Herrington are once again working together on big landfill deal. For the official story of how Herrington became involved in Big Sky, it seems we have no choice but to again rely on Gabe Kim’s testimony during the July 16 bankruptcy hearing. Q. Mr. Kim, you said, I believe that you have said that – in your declaration you say that you’ve engaged a Tom Harrington to operate the landfill? Q. And how do you – how did you come to meet Mr. Harrington? A. Mr. Ross Young introduced me to Mr. Harrington. Kim testified that he entered into a consulting agreement with Herrington in February or March. As a “key employee,” Herrington also has an ownership interest in the landfill venture, he said. My opinion, and it’s only that, is that Lanny Young, not his 25 year-old son, introduced Herrington to Kim, to the extent that, in reality, Kim is the actual superior to Young or that Kim had any role whatsoever in the decision to hire Herrington. On Thursday, I called the landfill and asked for Lanny Young. A woman who answered the phone said she had heard of Young but not met him and that he wasn’t at the site. She asked me if I wanted to speak with Tom Herrington. I identified myself and was somewhat surprised that Herrington came to the phone, as he assuredly knew I’d written before about him and Young. I asked if Ross Young was involved in the company. “I don’t know anything about that either,” he said. I asked him how he came to be hired by the Big Sky and he answered, reasonably, that that was his personal business. Herrington closed by asking, with what sounded like good humor, if I had any garbage. After getting over my surprise I told him we had some in the kitchen. He asked me, to my delight, to send him some because they needed the business! The permitting process of landfills occurs at the very start, and is extensive. But transferring permits is not a big deal. Basically, it’s a matter of the company that holds the permit signing a document transferring the right to operate the landfill and the obligation to do so in accordance with the requisite environmental regulations. In other words, there is no review process by ADEM — the Alabama Department of Environmental Management. I contacted ADEM Thursday and requested the permit transfer document if one existed. It did exist, but would not be finalized until the next day. The head of the solid wasted division, who I spoke to, said he was not aware of any involvement by Lanny Young in the permit transfer. On Friday, good to their word, ADEM sent me to the finalized permit transfer. It was signed by Katz and, for Big Sky, by Gabe Kim. The address of the company, as shown on the permit, was the same address used on the incorporation papers, which is to say, the Los Angeles County location of Platinum Auto Network. The permit transfer form showed Big Sky had to pay $665 to ADEM to effectuate the transfer. Someone at ADEM made the damnedest handwritten note on the portion of the form showing payment received. I contacted ADEM seeking an explanation for the notation, which, on its face, reflects a $665 check with neither a name or number on the check. It was late Friday and I did not receive a reply. I called Gabe Kim, using the “auto rental company” phone number he has listed on all the Big Sky documents. He answered the phone, but hung up after I identified myself. I also left a detailed voice message with Lanny Young, calling the number he had provided Hendricks when he first visited the landfill. I did not receive a call back. I thought it somewhat odd that Young’s number has a Montana area code. Could Young’s recent activities place him in jeopardy? Upon Young’s release from prison, in December 2007, he was placed on three years supervised release, or probation. One of the terms of his release was payment of restitution to the state of Alabama, for funds he was deemed to have stolen through the G.H. Construction scheme. Court records show that as of April 2009, Young owed $318,232, with interest to accrue until he paid the entire sum. During a seven month period in 2008 and 2009, all of Young’s reports failed to satisfy his requirements for full financial disclosure, court records show. Also, in January 2010, he received a payment of $10,000 for consulting services that he failed to report. As a result of those violations, Young was ordered to spend six days in jail and his probation was extended. Young is currently under the supervision of federal probation officials in Birmingham. A probation official said Young is scheduled to be released from probation in January 2017. He still owes the state $214,965. Nick Bailey was released from probation in 2012, but has not completed his restitution. Bailey’s current restitution balance to the state is $77,759.54, according to the probation official. Given Lanny Young’s past, and descriptions of his recent activities — such as masquerading as his own son — it seems fair to speculate that he has not disclosed his Big Sky related activities to his probation officer, assuming, as seems likely, that he is still required to do so. It also would appear that Young has done business in someone else’s name and possibly received payment in someone else’s name. 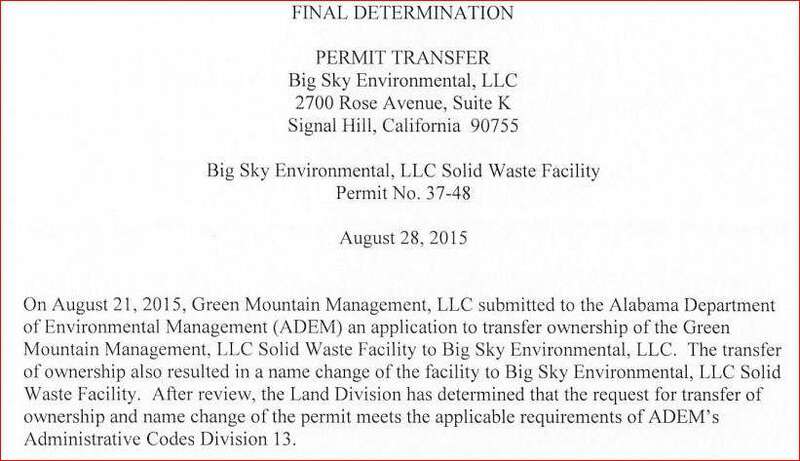 I believe — with admittedly no proof — that before or soon after Young’s first visit in January to Green Mountain, contracts or financial arrangements would have been drafted regarding what was to become Big Sky’s bid to take over the landfill. According to Kim’s testimony, as of July, the company has spent hundreds of thousands of dollars as part of its effort to purchase the landfill, including legal fees and payments to consultants. That money had to come from somewhere, and in all likelihood, only after agreements, pledges and the like were memorialized with signed documents. Logic would say so. It seems likely that well-directed subpoenas, whether filed by parties in the bankruptcy court or others, could lead to a better understanding of who really runs Big Sky Environmental, be it Gabe Kim or others. On Monday, Sept. 1, Kim testified again before the bankruptcy court. While I have not seen a transcript, it’s my understanding that he again testified that Young no longer has any role in Big Sky, such as a financial role or a role that involves providing services. On Tuesday, the bankruptcy judge reaffirmed her prior order transferring the landfill to Big Sky. Lanny Young and his lawyer, Steve Glassroth, arriving at court during the height of the Siegelman case. Researching and writing this story and putting on the website took, at a minimum, 70 hours, most of it since Wednesday. For me to continue following this story, and also to continue pursuing my reporting on the efforts against former PSC Commissioner Terry Dunn, I must receive donations. To make donations, large, medium-sized, or small, Go Here. 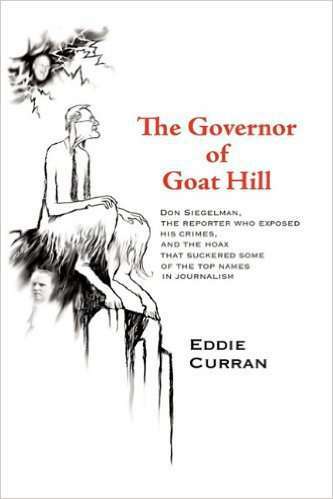 Also, those interested in buying a signed copy of my book, “The Governor of Goat Hill,” can do so by going to my other website, EddieCurran.Com. The book is also available online, at Amazon.Com, including for Kindle.